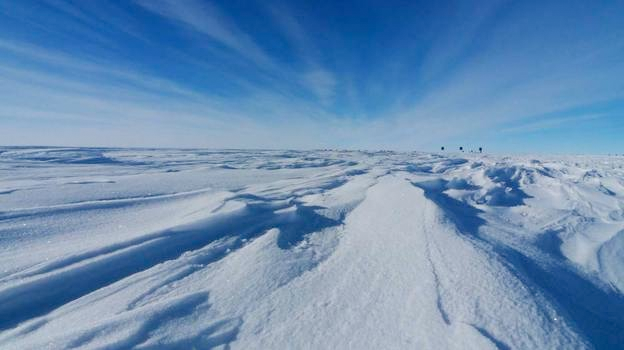 Just in time for the start of winter, NASA scientists have identified the coldest place on Earth: -93.2 C (-136 F) on a high ridge in Antarctica. Full story here. That beats the previous record of -89.2 C (-128.6 F) set in the Russian Vostok station in 1983. They used thermal imaging on the new Landsat 8 satellite to find the coldest spot in hollows near Dome Argus on the East Antarctic Ice Sheet. Except for the inside of volcanoes, this has to be the most inhospitable spot on earth. Carbon dioxide freezes at -78 C, which is 15 degrees warmer. Does this mean that Antarctica gets CO2 snow, like the Martian polar ice caps? Sadly, no. The -78 C is at 1 atmosphere of partial pressure, and CO2 in the air is only at 0.0004 atmospheres. At that pressure its freezing point is -140 C, another 50 degrees down. 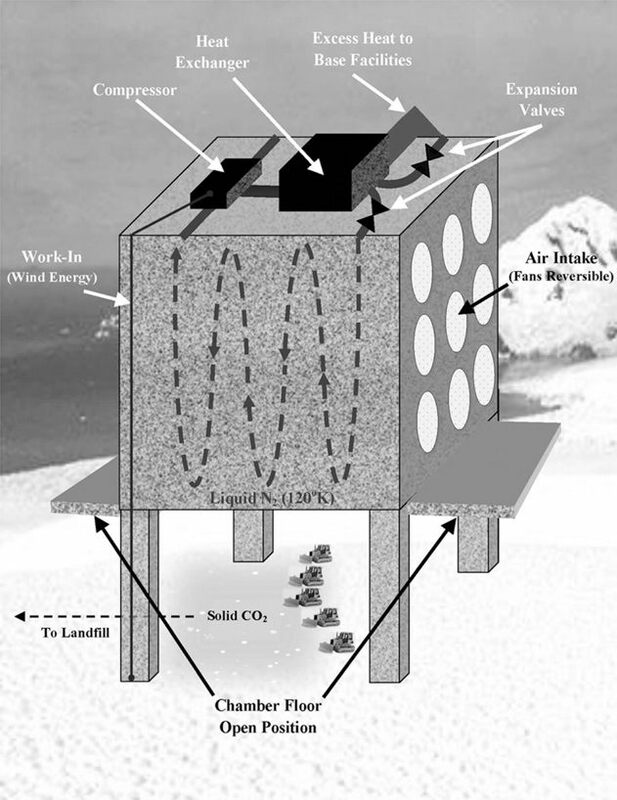 But searching for this led me to a truly maniacal idea for carbon sequestration: “CO2 Snow Deposition in Antarctica to Curtail Anthropogenic Global Warming” by Ernest Agee, Andrea Orton, and John Rogers of Purdue University (published Feb 2013, Journal of Applied Meteorology and Climatology). The idea is to freeze CO2 into enormous landfills in Antarctica in order to counteract global warming. Humanity is adding a net of about 4 billion tons of CO2 a year to the atmosphere. At a density of 1.5, that’s about 2.5 cubic kilometers of solid CO2 a year. If the landfill is 100 m deep, that’s an area of 25 km2 a year, or about 10 square miles. The energy needed to chill it down to freeze it would come from big wind farms. There are constant katabatic winds that flow off the cold, high ice sheets down to the warmer ocean, so site the windmills there. You would need about 80 GW of windmills to freeze out all the CO2. That sounds like a lot, but the US had about 60 GW of wind installed as of 2012, and it’s growing at 30% per year. Worldwide there was about 280 GW installed, growing at 25% per year. Using that wind power to freeze CO2 would remove a lot more CO2 than using it to displace coal. The authors envision giant freezers 100 m on a side and standing on stilts. They would have hatches on the bottom. They would freeze a foot or two of CO2, then open the hatches and dump it down. Bulldozers would then push it into the landfills. I think a better scheme would be to put the freezer on caterpillar treads and have it drive very slowly along a landfill trench. Maybe it could be staffed by Jawas. A crane ahead of it would be excavating the trench as the freezer moved. Where all that ice would go is left as an exercise for the reader. The sides of the landfills are to be insulated to keep the cold in. The average year-round temperature up on the Sheet is -57 C, so continuous cooling would be needed. If the partial pressure of the CO2 inside the landfill could rise to 1 atmosphere (perhaps by building a big tank), then the landfill could be maintained at -78 C, which would take much less energy. All this would be a pretty major industrial operation. It would be a reverse oil boom – putting the carbon back underground instead of taking it out. It would be the Wild South, with rednecks driving bulldozers and cranes amidst the howling storms, and then going for tension relief in the hot nightclubs of McMurdo Station. The landfills would have to be maintained indefinitely, or at least until some better solution comes along. Maybe it can ultimately be injected deep into the earth where it can then turn back into oil, or maybe fusion will finally work and it can be turned back into coal. Yet if the refrigeration ever failed, the results would be unpleasant. A blast of CO2 would asphyxiate everyone around them. You might get a local super-greenhouse effect, and turn the Sheet to slush. That might cause more landfills to fail, and then the whole thing boils away in a chain reaction. OK, so maybe this is not the total answer to climate change. Maybe it’s enough to contend for Richard Branson’s Virgin Earth Challenge ($25M for the best idea to sequester a billion tons of CO2 a year), but apparently it missed the entry window. Still, as warming gets worse and worse, more and more desperate geo-engineering solutions like this will look better. Even if it cost $100 billion a year (Iraq war levels of funding), that’s chump change compared to losing all the farmland on the planet.